My Valentine's Day got started with the delivery of these! 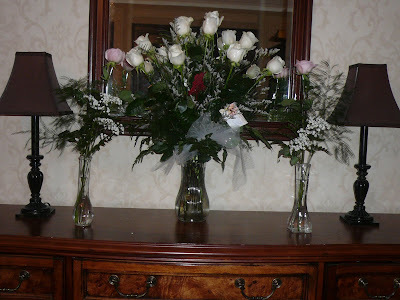 Ivory roses from Doc for me and one pink rose for each of his daughters! 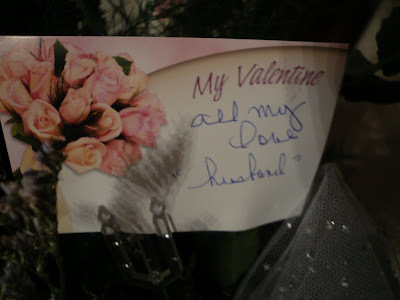 He has always bought me ivory roses from our beginning and we had them at our wedding! Valentine's morning, Doc got Ladybug out of bed. She loves it when he gets her up. It starts her day off right! 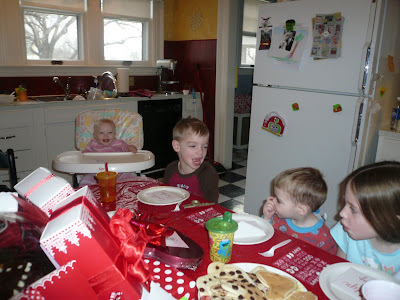 He brought her down to the kitchen where a Valentine's Day breakfast was waiting! 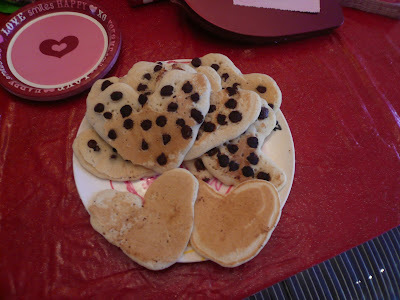 Complete with heart shaped chocolate chip pancakes! Once everyone was at the table, the party began! 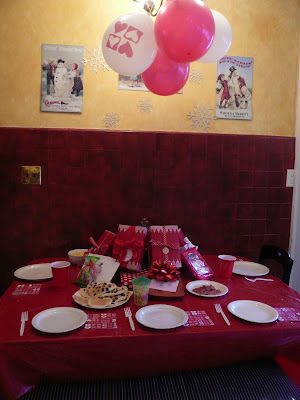 After breakfast, came the presents! I gave Doc a KU basketball history book! 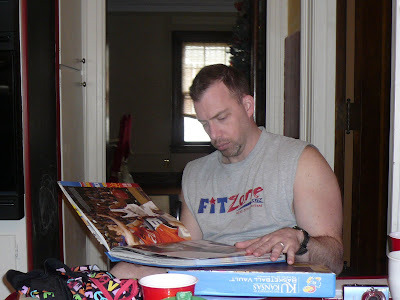 I think he liked it, judging by how engrossed he became while flipping through the pages! 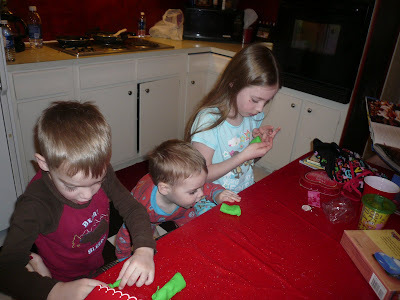 The kids got chocolate and various other presents! 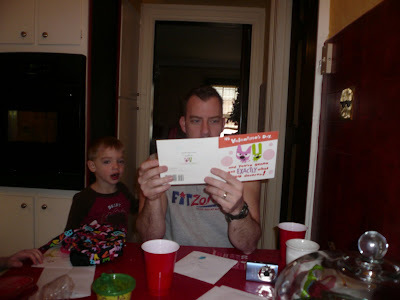 They were most excited about giving Daddy the cards they picked out for him! 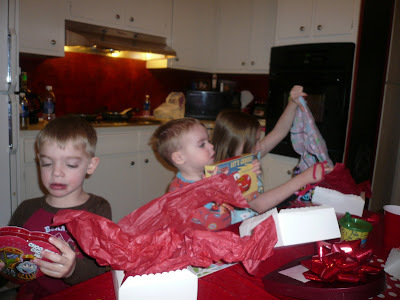 The most popular card was the Kung Fu Panda card from Bub because it played the song, "Everybody Was Kung Fu Fighting." 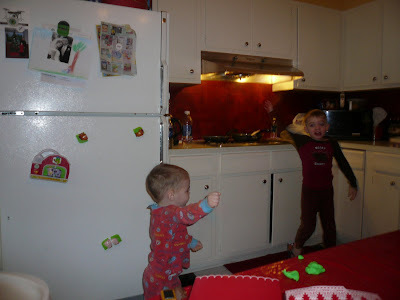 Of course the card incited an impromptu dance party in the kitchen. 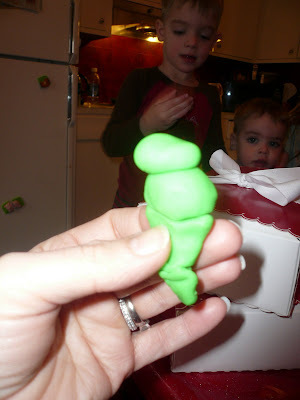 Then they played with Bub's playdough and created "treats" for me to "eat." Like this ice cream cone Bub made. Delish. 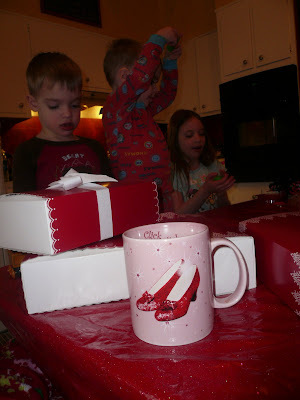 As the kids played away with playdough and Doc sat engrossed in his book, I enjoyed drinking coffee from my Ruby Red Slippers mug that Birdie gave me! I thought to myself, there really is no place like home, especially when your home is filled with love and laughter like mine is! 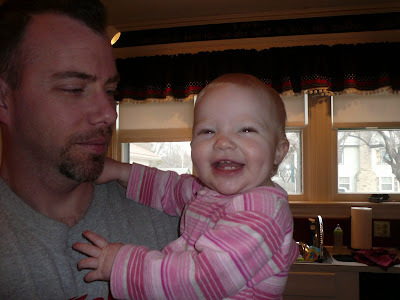 I was reminded once again that eventhough being a mom and wife is crazy at times, I am truly blessed! How great to have a day to celebrate the love we have for eachother! Boy! Have doc give lessons! What a great dad and husband. You are a blessed woman. :) Darling pics. Thanks for sharing! WOW! It's like Christmas! What a fun time for you! Roses...way to go doc! I Haven't Fallen Off the Face of the Earth...Yet. Is He Sweet or An Evil Genius?